With the fate of his kingdom - and perhaps all the Western civilized lands - at risk, King Conan has formed an unlikely alliance with the Pictish Wolf Clan. They share a common enemy in the mad witch Kwarada, whose alliance of the Pictish tribes under the Iron Crown of Brule would spell destruction for Pict and Aquilonian alike. Yet events have become stranger still, with the heir to the Wolf Clan's leadership abducted and readied as a sacrifice to awaken the dreaded Children Of The Night! Once again, Tim Truman has told a tale worthy of Robert. E. Howard himself. This story was well-researched in regard to the history of Hyboria and - as before with his shout-out to Kull in the first issue - Truman pays homage to another of Howard's heroes. Tomas Giorello and Jose Villarrubia match Truman's script in quality, delivering more of the epic artwork we've come to associate with the various King Conan mini-series. Highly recommended. 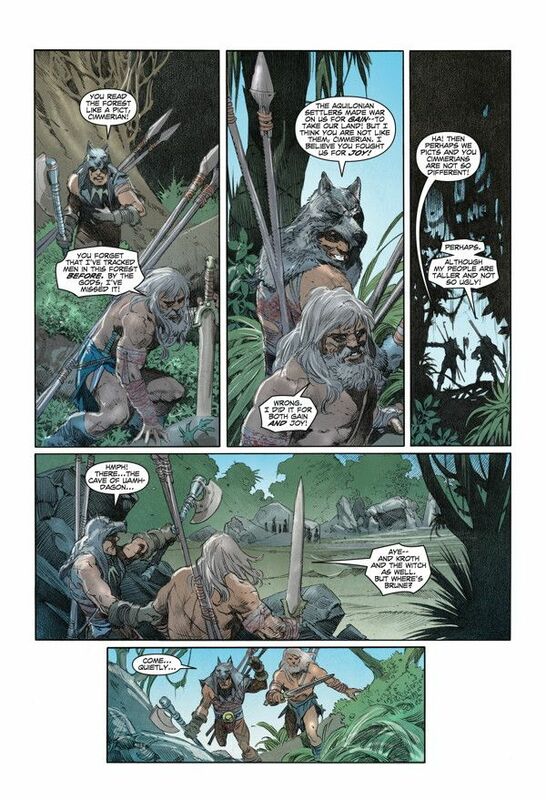 King Conan: Wolves Beyond The Border #4 is due out on 03/30/16!